JERUSALEM (AP) _ Security has traditionally trumped all other concerns in Israel. Now some social activists fear a sudden spike of violence with the Palestinians could overwhelm a spontaneous and surprisingly strong summer-long revolt against the country’s high cost of living. A deadly ambush that killed eight Israelis, and subsequent Israeli airstrikes and rocket barrages from Gaza over the weekend, have abruptly shifted the country’s attention away from the economic protests that were coalescing into a serious threat to the government. Now the security situation is the center of attention again. The question is whether things will ever shift back to the brief period marked by heightened awareness of social ills, but also near-giddiness over the prospect that Israel might become a “normal” country where money matters, not military needs, can take center stage. For once the focus was high prices, not Palestinians, rockets and airstrikes. Thousands of Israeli erected protest tents in city centers and hundreds of thousands took to the streets in mass demonstrations that became a weekly Saturday night ritual this summer, sending Prime Minister Benjamin Netanyahu scrambling to find solutions and keep his government together. This Saturday, however, with cities in southern Israel under fire, organizers called off plans for a mass protest and made do with a subdued vigil of several thousand people in Tel Aviv. A man in the southern city of Beersheba, where a large protest was held a week ago, was killed by a rocket earlier in the day. Stav Shaffir, one of the protest movement’s leaders, said Sunday that protesters in several of the movement’s tent encampments in southern cities were forced to seek cover in bomb shelters. Given this, she said, it was only natural to maintain a low profile while guns were roaring. But she insisted the attacks would not derail the protests. Adar Stern, a protest leader in Beersheba, said the local protesters have moved their tents close to bomb shelters but have no plans to go home. The protests, which began after a relative lull in Israeli-Palestinian violence, initially targeted soaring housing prices, but quickly evolved into a sweeping expression of rage against a wide array of economic issues, including the cost of food, gasoline and education, the country’s spending priorities and a seemingly inexorable shift to American-style capitalism. Israel emerged from the global financial crisis relatively unscathed. The economy has enjoyed rapid growth, and unemployment is at its lowest point in decades. The country’s economic strength has come at a cost: the ranks of the working poor have grown dramatically as wealth has become concentrated among a sliver of society, symbolized for many by a tiny group of increasingly high-profile tycoons. 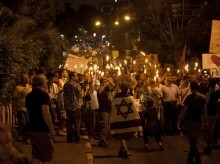 In less than a month, the protests ballooned from a few tents in Tel Aviv into a nationwide phenomenon. Despite the violence, the demonstrators are still calling for a million-person march in 50 cities across the country on Sept. 3. That could be a test, and such tests of social campaigns have been failed in the past. Israeli history indicates that social welfare concerns often get swept aside when violence flares up, particularly if the protesters make demands that could come at the expense of funding for the military. One famous campaign by a group of Moroccan-born activists calling themselves the Black Panthers came to a standstill after Israel suffered devastating losses in the 1973 Mideast War. Another protest against Israel’s high cost of housing ended when the first Gulf War broke out in 1991, as the country was hit by Iraqi missiles, according to John Gal, an expert on social policy at Hebrew University in Jerusalem. But this pocketbook protest could be different and could stay afloat even with the violence, economist Dan Ben-David said. Roni Barak, 52, who works at a food stand in Jerusalem’s open-air market, said the impact of the attacks would be strong but fleeting.